Press releases do not work anymore and the editor is on a diet and does not need another press lunch. In our PR event in San Francisco last year Ben Parr co editor of Mashable clearly said if you just send him a press release it will go in the deleted folder. Today there are many more audiences and conversations happening about your brand in many more places and every one of them is an online media outlet. You need to be able to reach the people who count in a way that is meaningful. Social PR enables this and we have put together a whole day to explore case studies and tips to develop your social PR. Guy Esnouf, Director of Communications at E.ON UK in which he explained how the power company used social media to outwit environmental protesters during last year’s protests at Kingsnorth Power station. “What do you do when you’re involved in an argument you can’t win?” he asked. Well, in his case you use YouTube and Twitter to get the news (your preferred news) to journalists (the traditional ones) before the protesters get their message across. 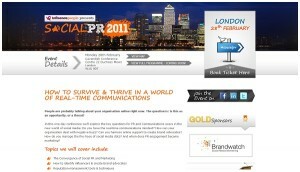 I’ll be discussing this – plus crisis & reputation management, monitoring and measurement, influencer analysis and outreach and more at Social Media PR (2011) in London on 28th February. Join us for a guaranteed fascinating day.